Fresher look, more technology for Audi’s stylish two-door. “Our coupes turn every day into a holiday for our customers,” proclaimed Audi chairman of the board Rupert Stadler as he revealed the all-new A5 and S5 coupes in Germany today. Related to the 2017 Audi A4 sedan, the new coupes arrived with an evolutionary design but significant mechanical and technology upgrades. “We have more performance and better fuel economy, much more space, and the standard spec brings our midsize coupes to the level of a luxury car,” Stadler continued. Visually, the new Audi A5 and S5 don’t take a huge leap forward from their predecessors, instead tightening up the basic design language of the smart two-doors. Increased use of aluminum and high-strength steels helps cut weight by about 132 pounds, even though the car is 1.8 inches longer, and offers more interior and trunk room, and the resculpted exterior cuts a super-efficient 0.25 drag coefficient. The Audi A5 will offer five different engines in Europe, and though few specs were shared, Stadler says they will be up to 20 percent more powerful than the old model’s engines while also cutting fuel consumption by about 20 percent. In the U.S. market, expect the Audi A5 to offer the same powertrain as the A4 sedan, meaning a 2.0-liter turbocharged inline-four good for 252 horsepower. Most models will use a seven-speed dual-clutch transmission, though European buyers can also opt for a six-speed manual, and an eight-speed automatic will be offered on the S5 and the top-spec 3.0-liter turbodiesel. 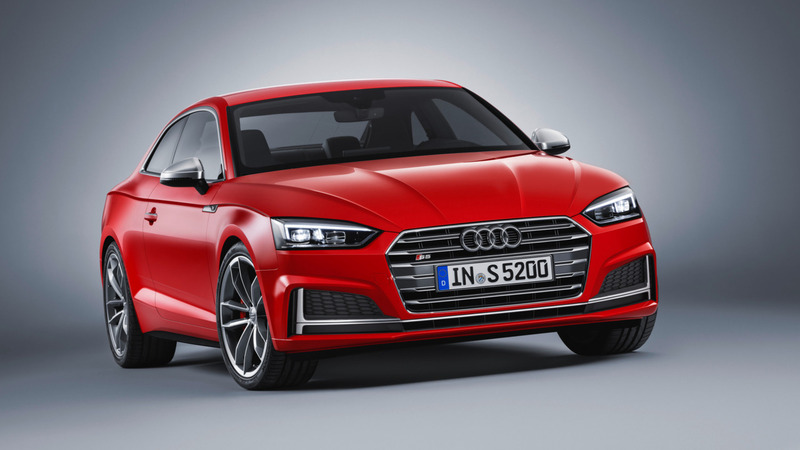 As with the new S4 sedan, the new Audi S5 packs Audi’s new 3.0-liter turbocharged V-6 engine. It delivers 354 hp, with the sprint to 62 mph taking just 4.7 seconds. The S5 wears a sportier body kit and receives commensurate braking and handling upgrades to match its power, as well as special S-Line interior components. Quattro all-wheel drive is standard. New technology largely mirrors what is offered on the 2017 Audi A4, including the brand’s cool Virtual Cockpit fully digital instrument cluster, new active safety technology including exit warning and pre-collision braking, and Android Auto/Apple CarPlay integration in the infotainment system. The A5 is also the first Audi to come with a new “unlimited” SIM card that works across Europe, without roaming charges, for in-car connectivity. The list of standard equipment (in European models) has grown to include LED head- and taillights, Bluetooth, Audi pre sense city pre-collision braking, and a 7-inch infotainment display. Order books for the new Audi A5 and S5 open this July, with the first deliveries scheduled for the fall. The will reach the U.S. sometime after that, possibly in in 2017, with official specs and pricing figures for this market revealed closer to that time. Audi revolutionized its mid-size class in 2007 with the A5. The Ingolstadt-based carmaker created a work of art that took fans around the world by storm. Nine years later marks the launch of the second generation – with a new, honed look and high tech everywhere. The new generation of the A5 Coupé* is athletic, sporty and elegant. Its design goes hand in hand with sophisticated aerodynamics. Under the skin the A5 impresses with an all-new chassis, powerful engines, and innovative infotainment features and driver assistance systems. How do you make a design masterpiece even more beautiful? Audi designers have been pondering this question for years. The results are impressive: The new Audi A5 Coupé* sports a fresh, modern and honed look. It is nevertheless true to its DNA with the sporty and elegant character being passed down to the new version. The best example is the now three-dimensional wave-shaped shoulder line that already characterized the previous model. The precisely sweeping line with pronounced bulges over the wheel arches emphasizes all four wheels – a cue to the quattro all-wheel drive. The perfectly balanced proportions with a long engine hood, the stretched wheelbase and short overhangs underscore the sportiness of the new A5 Coupé. The sculpted Singleframe grille is significantly flatter and wider than in the previous model. The LED rear lights and optional LED or Matrix LED headlights with dynamic turn signals make high-end technology visible even after dark. The new Audi A5 Coupé* will launch in Germany with five engines: two TFSI and three TDI units. Their power output has increased considerably and is now between 140 kW (190 hp) and 210 kW (286 hp). Compared with the previous model, they offer up to 17 percent more performance while consuming as much as 22 percent less fuel. All the engines combine high efficiency with sporty power development and smooth running – especially the two 3.0 TDI six-cylinder engines. With its newly developed 3.0 TFSI, the Audi S5 Coupé* is now in a league of its own. The turbo V6 exhibits highly efficient, sports car-like performance. From its 2,995 cc of displacement, the boosted six-cylinder engine produces 260 kW (354 hp) of power, which is 15 kW (21 hp) more than the engine in the previous model. The new Audi A5 Coupé* comes with a drivetrain solution tailor-made for each engine variant. The manual six-speed gearbox and the seven-speed S tronic are used with the four-cylinder engines as well as the 160 kW (218 hp) 3.0 TDI with front- or all-wheel drive. The eight-speed tiptronic is reserved for the top diesel with 210 kW (286 hp) and the S5 engine*. Both engines come standard with quattro all-wheel drive. Audi also offers the optional rear-axle sport differential for even more dynamic driving and precision. The new quattro with ultra technology is also available for the first time. At the moment it can be combined with the four-cylinder TFSI and TDI engines with manual transmission. Optimized for efficiency, the drive system does not exhibit any perceptible differences to permanent systems in terms of traction and driving dynamics. The all-new chassis is among the strengths of the Audi A5 Coupé*. It offers the driver optimal comfort combined with a high degree of agility. The A5 thus handles narrow, winding mountain roads and long trips on the Autobahn with equal aplomb. Audi offers a suspension with damper control as an option. This is integrated into the dynamic handling system known as Audi drive select, which enables the driver to modify the basic characteristic in multiple steps. The electromechanical power steering is also a new development from Audi. It adapts according to the vehicle’s current speed and provides highly precise road feedback. Optionally available is the dynamic steering, which varies its gear ratio depending on the speed and steering angle. The Audi A5 Coupé* is significantly more efficient than its predecessor. This is due in large part to a reduction in weight as well as sophisticated aerodynamics. The engineers were able to trim the curb weight by as much as 60 kilograms (132.3 lb). The body is the lightest in the competitive field thanks to an intelligent mix of materials and lightweight design. With a drag coefficient of 0.25, the A5 Coupé is also the segment leader with respect to aerodynamics. The interior benefits from the increased dimensions and longer wheelbase. Space for driver and passengers is more generous. The horizontal architecture of the instrument panel and the continuous air vent strip create a wide sense of space. A5 Coupé* also redefines the class benchmark for aeroacoustics. The acoustic comfort is almost that of a luxury class model. (0.4 cu ft) more than with the previous model. The rear seat has a 40:20:40 split and can be easily folded forward using levers in the luggage compartment. Audi also offers the two-door coupé with optional gesture control for opening the luggage compartment lid via a foot motion. The optional trailer hitch is electrically released at the press of a button. Customers choosing MMI navigation plus automatically also get the hardware module Audi connect and the new Audi connect SIM, a SIM card permanently installed in the car. The new Audi A5 Coupé* uses this to connect to the Internet via the ultrafast LTE network. Use of the versatile Audi connect services is free of charge of three years, both in Germany and in most European countries. The respective national provider is selected automatically as needed. Independent of the integrated Audi connect services, customers can also purchase optional data packages for individual Internet use using the Wi-Fi hotspot. This allows all passengers to surf the Web and send/receive email with up to eight mobile devices at attractive rates. The A5 can also be equipped with the optional Audi connect safety & service package. This includes such functions as an automatic emergency call in the event of an accident, online roadside assistance and Audi service request as well as remote functions that can be used with the MMI connect app on a smartphone, smartwatch or – in conjunction with the fourth generation Apple TV – from a television. Examples include locking and unlocking the car, checking where the car is parked and calling up the vehicle status. With the Audi smartphone interface, Apple Car Play and Android Auto bring the familiar smartphone environment to the car, if desired. The optional Audi phone box with wireless charging in the center armrest uses near-field coupling to link smartphones wirelessly to the vehicle’s antenna and enables inductive charging according to the Qi standard. For very discerning hi-fi fans, the Bang & Olufsen sound system with its innovative 3D sound is available as an option. An intelligent combination of different technologies enhances the safety, comfort and efficiency of the new Audi A5 Coupé*. At the same time, Audi is also taking the next step toward piloted driving. The broad choice of innovative driver assistance systems sets standards in the segment. Compared with the previous model, nearly all of the systems are either completely new or have been extensively updated. The predictive efficiency assistant helps the driver save fuel, Audi active lane assist helps keep the car on track in the driving lane, and the Stop&Go adaptive cruise control including traffic jam assist offers the driver relief in slow-moving traffic. New and important safety features include the park assist, cross traffic assist rear, exit warning, collision avoidance assist and turn assist as well as the Audi pre sense systems. Camera-based recognition of traffic signs rounds out the lineup. The new Audi A5 Coupé will launch in Germany and additional European countries in fall 2016. Compared with the previous model, the list of standard equipment is even more generous. Among the features included are xenon headlights with LED daytime running lights and LED rear lights, LED interior lights, the Audi MMI radio plus with 7-inch MMI color display, Bluetooth and USB charging function, the three-spoke multifunction steering wheel (including shift paddles in models with automatic transmission), height-adjustable belt feeds, the Audi drive select dynamic handling system and Audi pre sense city. New trim lines provide numerous customization opportunities, for both the interior and the exterior. Besides the base model, there are also the sport and design lines. The S line sport package and the Audi design selection are available for sophisticated customization, particularly for the interior. Audi offers the S line exterior package for a particularly dynamic appearance. From 0 to 100 km/h (62.1 mph) in 4.7 seconds. The new Audi S5 Coupé* combines dramatic elegance with the performance of a sports car. Its newly developed, turbocharged V6 engine produces 260 kW (354 hp) and consumes just 7.3 liters of fuel per 100 km (32.2 US mpg). The sharper S exterior design and the S-specific details in the interior underscore the dynamic character of the Audi two-door sports coupé.